This month we celebrate Valentine’s Day and you are sure to see anything and everything pink and red for the first few weeks. Here at F.I.N.D.S. love is in the air, but not always in the most expected way. This month is all about love! The things we love, the design ideas we get when we want to add a little love to a room, and tips on how to use love as a theme without being cheesy about it. For example our monthly mood board screams love to us, but is absent of the typical things you think of. We did not include the color red or pink, there are no hearts, and there is nothing frilly or girly about it. Instead we chose a great chinoiserie wallpaper, added some gold and vintage accents, and a great regency style lamp to give the feeling of love. We added a little romance to the space without being so obvious about it. Paul Montgomery Fairington FK HC137 Chinoiserie Wallpaper – when we think of love and romance we immediately picture a gorgeous chinoiserie wallpaper. No matter what the design these always inject a little romance into a space and with romance you get love! 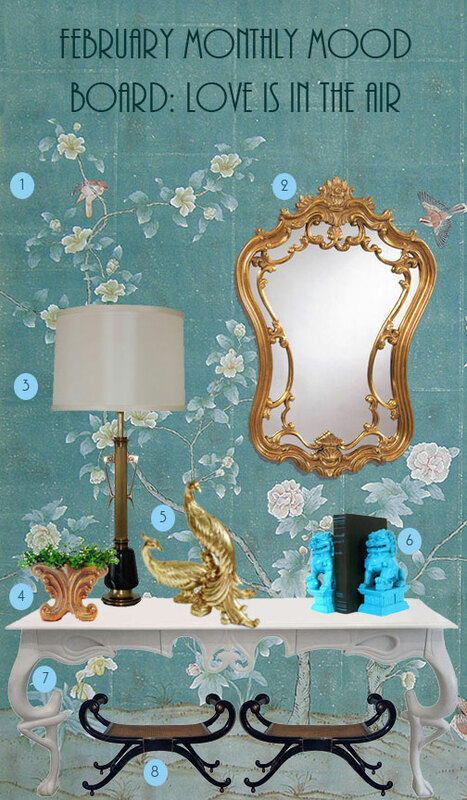 Decorative Rococo Style Antique Gold Mirror from Bellacor – Nothing goes better with Chinoiserie wallpaper than an ornate gold mirror. The ornate elements of the mirror add romance to a space. This is a great way to add that feeling without using ruffles or anything frilly or girly. Hollywood Regency Table Lamps from Swank Lighting – Every console table needs a fantastic lamp. A lamp is the perfect item to play with the scale. With the mirror offset over our console table we are able to place an oversized lamp at the other end to add some height to our table. These lamps are made of marble and brass and manufactured by Rembrandt. Gonder Fleur de Lis Vase from Recent History on Etsy – We love the low profile of this vase and the gold crackle finish. This is the perfect vessel to use to add a pop of color to the table with some plant life. Vintage Hollywood Regency gold Peacock Statues – Peacocks themselves are gorgeous birds that have a bit or romance in them. The pattern of their feathers and their jewel tone colors are great additions to any space. Use these gold statues on a console table and pull inspiration from the bird to add pattern and color to the rest of your space. Turquoise Foo Dog Bookends from Nashpop on Etsy – I have been on the hunt for the perfect pair of Foo Dog bookends for quite some time now. This is the perfect addition to any space with a Chinoiserie influence. Hollywood Regency White Lacquered Console on 1stdibs – We love the lines of this table and the regency feel it has, but with a modern twist. The lacquered finish updates the table a little and the white color helps it to blend with our wall covering and let that be the star. Regency Style Black Lacquered Bench from Era Interiors – We love these benches for the beautiful curved silhouette they create. The black lacquered finish contrasts with the console table and the wall covering, but the profile of the benches is low enough that it adds a great pop of design without taking away from the beauty of all the elements coming together. « Studio Em Interiors Website is LIVE! Thank you Atomic Hostess! Glad you like it!